The utility companies recommend to shut off gas immediately after an earthquake if one smell gas. If you are at work or away when an earthquake hits, then you may not be able to get home in time. So a automatic system is required to shut off gas flow to avoid fires or explosions due to gas line breaks which may worsen the situation after an earthquake. An earthquake valve will take care of this instantly for you. An earthquake valve or seismic valve is an automatic way to shut off the low pressure regulated gas supply to a structure during a major earthquake and/or if a pipe is broken. These are applicable both to utility supplied natural gas and to gaseous liquefied petroleum gas (LPG). 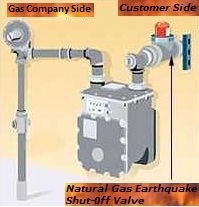 A natural gas earthquake shut-off valve automatically shuts off your gas service when an earthquake of a sufficient magnitude occurs at your home's location. After the quake has stopped and you have determined that it is safe to do so, follow the manufacturer's instructions for restoring your gas service. You will need to make sure no gas leaks exist and re-light your pilot lights. You must ensure that your appliances are safe before operating them. The Gas Company charges a fee to reset valves and re-light pilot lights when your seismic shut-off valve has closed due to a non-seismic occurrence. 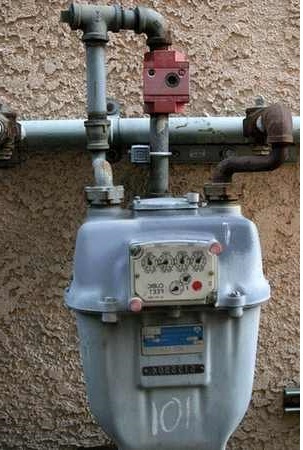 If you like to install an earthquake gas shut-off valve, or are mandated to have one by your insurance company or the local building code, the valve must be installed on the downstream side of the meter. The downstream side is the customer side of the meter. The Gas Company recommends that you contact a licensed, qualified professional or The Gas Company to reset the valve, and to verify that no gas leaks exist, to ensure that all of your gas appliances are safe before being placed back in operation and to re-light your pilot lights. Remember that following a major emergency it may take many days or even weeks before someone can come to your location. The strange little red thing on the gas pipes (left) is an earthquake valve. It shuts off the gas automatically if there is an earthquake. There are Two types of valve, one is sensitive to motion and the other to excessive gas flow. The most secure installations would use one of each type connected in series. 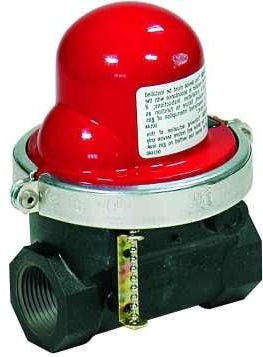 Excessive flow sensor: A valve is closed when the flow exceeds a certain limit appropriate to the application. This will only operate when a pipe is broken, and so may not operate if a small (yet potentially dangerous) leak is present. If activated, any faults in the piping must be first repaired. Motion sensing caged ball: A metal ball is retained away from an orifice by sitting upon a ring. Any shaking of the mechanism will cause the ball to roll of its ledge and fall down to block the orifice. it is reset using either an external magnetic device or an internal lift mechanism. If too sensitive it may be triggered by passing vehicles on a rough road. 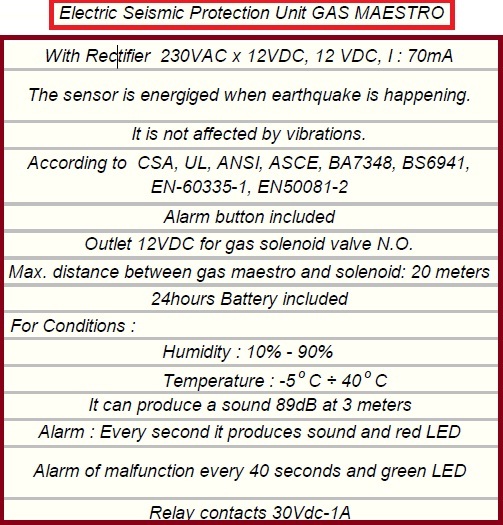 In the case of a severe seismic event, the gas piping should be completely inspected for breaks before resetting and then "sniffed" using a gas detector device after resetting. Since all pilot lights will go out, some appliances must be properly restarted once the device is reset. The safest means is to have the gas supplier inspect the piping and relight the appliances, even though this could take quite a while in an event affecting a wide area. Such inspections and relights are typically performed without charge by the provider. I like the valuable info you provide on your articles. I’ll bookmark your blog and check again right here regularly. I’m quite certain I will be informed a lot of new stuff right here! Good luck for the next!Gas Flow Meter: GFM100. We supply valves with Seismic Qualification for Nuclear application. The valves are from Arako Czech republic. We have supplied the valves for Kaiga, Kundankulam and RAPP. in India.